A few years ago, online marketing was all about apps or infographics, but now a new player has come into the spotlight: the chatbot. Why have chatbots became so popular lately? Is it just hype or something truly revolutionary? What are chatbots and what benefits do they have? What are the common types of chatbots? How do you create a great chatbot user experience? How do you build a chatbot and what tools do you need? Chatbots have existed for decades, but businesses have only recently begun to exploit the opportunities they provide. You can find chatbots in messaging apps on smartphones for personal use or on company websites for business use. A well-optimized chatbot can be a great addition to a company’s website because it can help to boost your conversion rates. 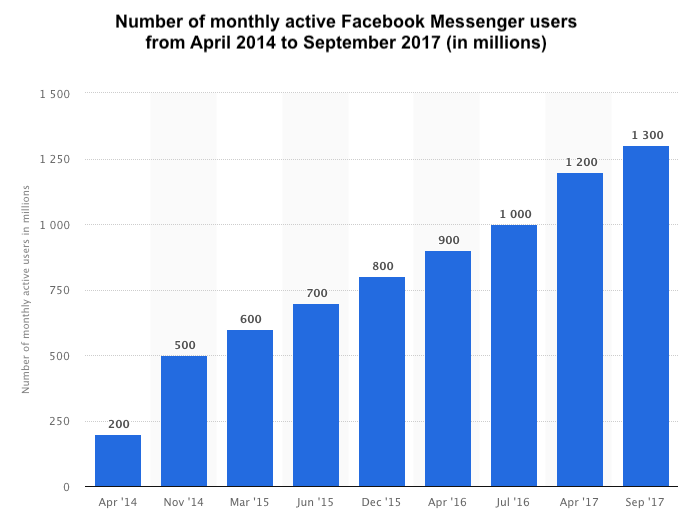 The real credit for bringing chatbots further into the spotlight goes to Facebook Messenger, due to the fact that Facebook made it possible to integrate chatbots into the platform. Most of these were created for customer service, but some were created to solve other, unique solutions – like the bot that is designed to combat workplace harassment. Web development allows you to build beautiful websites that scale well on multiple devices. We have apps for almost everything. Do we really need more? We do. To be specific: users do. The world is changing constantly and I’m not only talking about rockets landing on drone ships. The general user expectations have changed a lot in the last couple of years. Nowadays, companies that want to sell something or need more subscribers have to stand out of the crowd. The best way to do so is to insert new elements into the already-existing business model and improve the user experience. 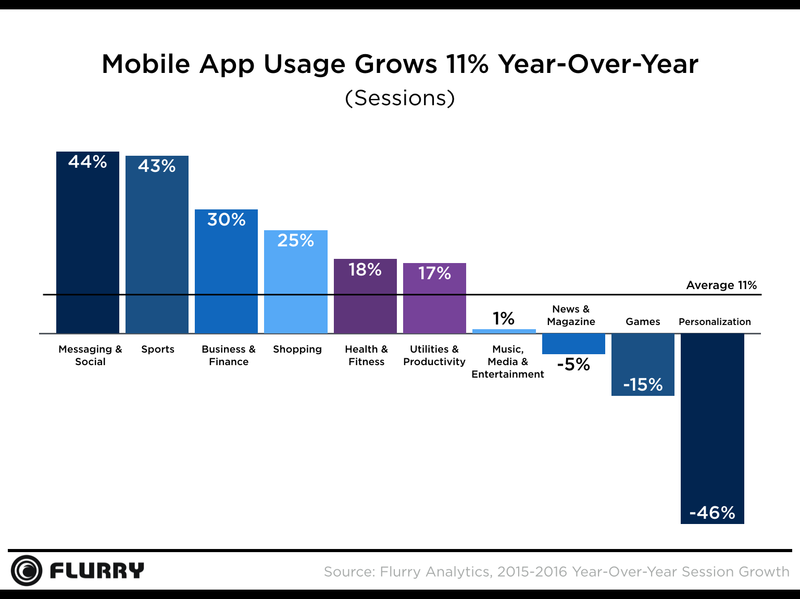 Apps are everywhere and people are sick of them: between 80-90% of apps are used once and then deleted. 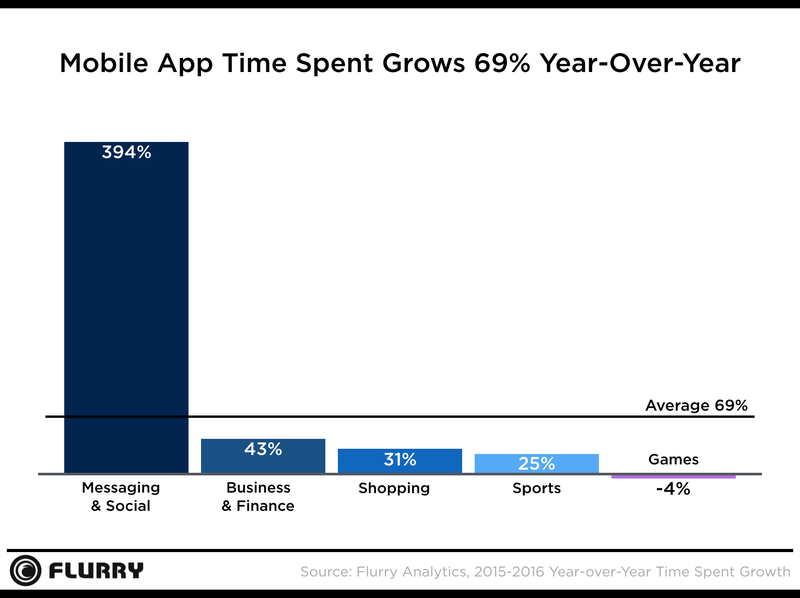 The one exception is messaging apps, which account for 91% of time spent on mobiles in the U.S.
Chatbots have potential. Even though they are increasingly used, the modern chatbot is still a young technology. With the continuing development of AI, the potential for bots in business and personal lives is unlimited. They can be easy to build. 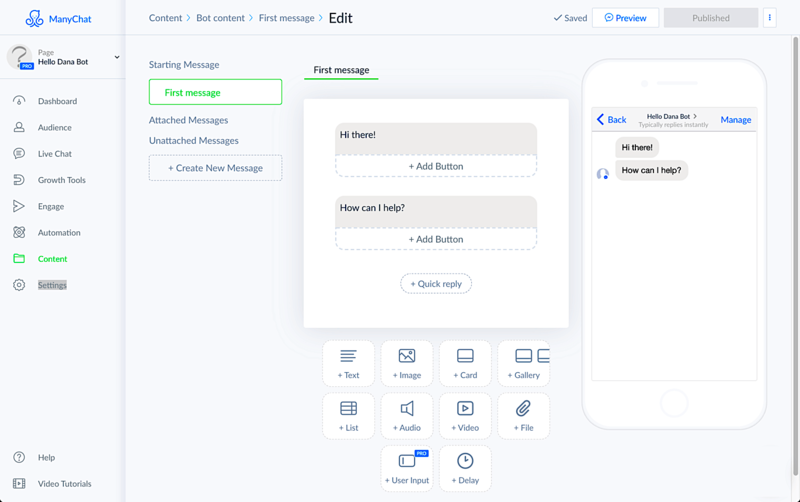 It depends on what you want to achieve, of course, but you can design a simple chatbot based on the Facebook Messenger without any programming experience. Chatbots emphasize the company’s brand and image. 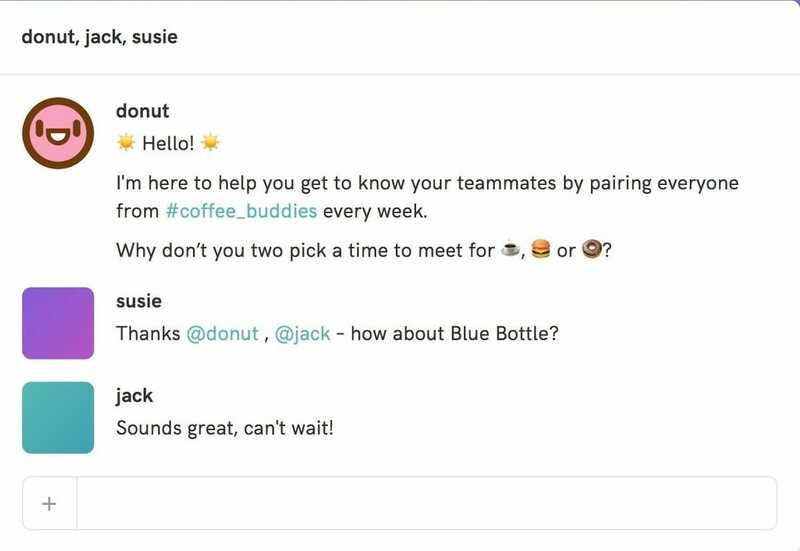 The chatbot represents the company when it’s communicating with the customer, so, from a marketing point of view, it is a perfect embodiment of brand building. They offer straightforward services. A well-optimized chatbot communicates only the essentials and does not overwhelm the user. Chatbots automate processes. Bots are able to take on human work for, generally speaking, mundane or basic analytic tasks. Simple (Scripted) – This is the simplest type of chatbot. Conversations with this type can only take place in pre-defined ways and directions. In other words, you’ll get a pre-programmed response to each question you ask. The chatbot cannot deviate from this in any way. 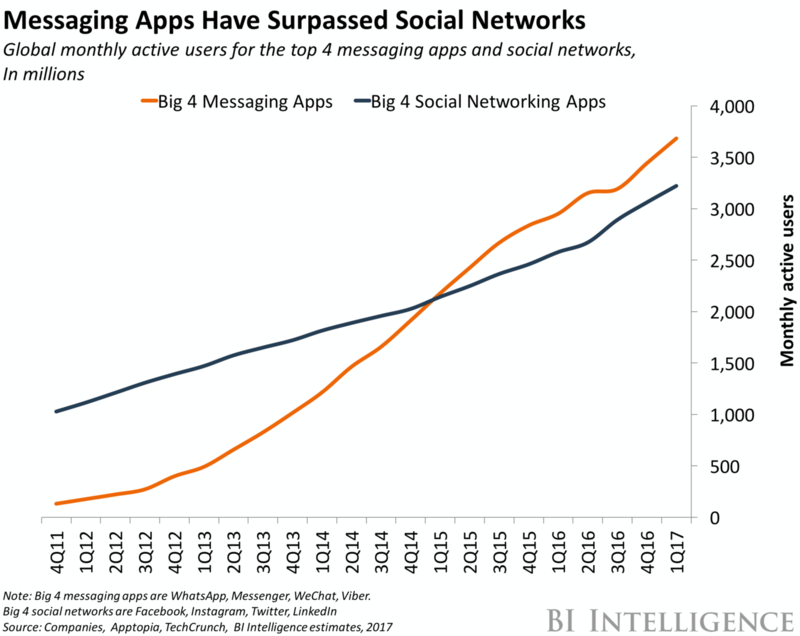 Simple chatbots appear in messaging apps such as Messenger or Skype. Their sole purpose is automation, like booking a flight or making a purchase. Intelligent – Using artificial intelligence allows the chatbot to provide more flexible responses to the user’s questions. This type of bot (such as Cleverbot) learns from each conversation and uses these experiences to answer future questions more accurately. However, artificial intelligence also has limitations: a chatbot built with AI technology still cannot understand more complex contexts or lead the conversation – it only gives answers. Chatbots can also be distinguished by the number of users involved in the communication process. Personal chatbots offer a direct communication between a single user and the bot. 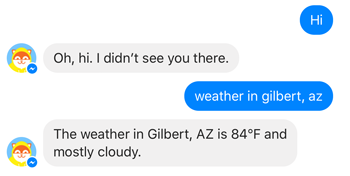 A good example can be a personal assistant bot, like Poncho the weather bot built on the Facebook Messenger or Google Assistant. These chatbots are often preferred when the service has to go deeper into detail. A great example is Airbnb’s chatbot, which can notify users of specific discounts, help them book flights, and select accommodations based on location, time or price. 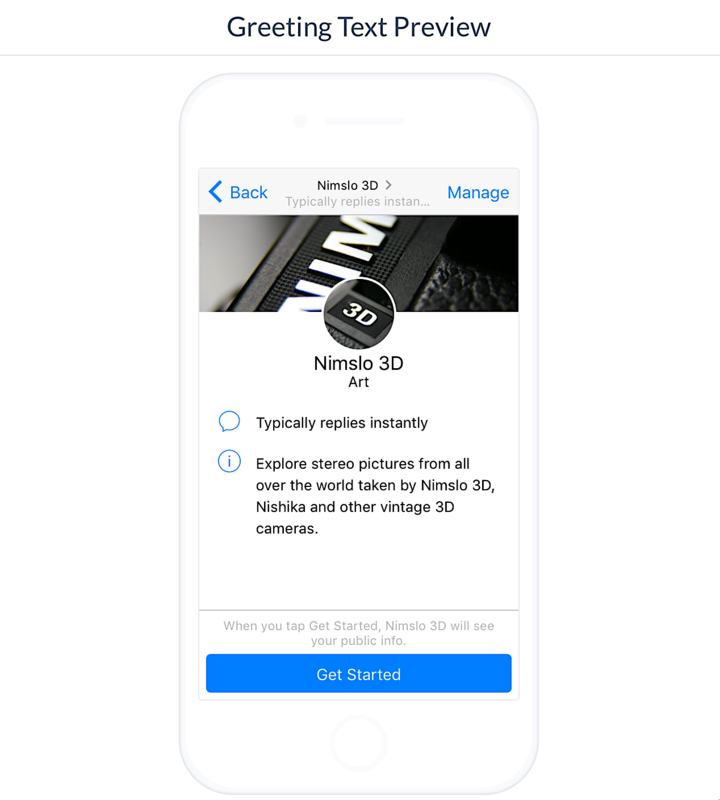 This is a great alternative to apps, which can be frustrating to download and install just to complete a simple request. If we take a step back and think about Amazon’s Alexa, we can say that it’s a personal bot. However, that’s not entirely true. The fact is that Alexa is a mixture of a personal and a team bot. It’s personal because it treats everyone in the household as an individual; it’s a team bot because those who live under the same roof are considered a team. If family members ask for tasks at the same time, Alexa will process the requests because it can learn the voices of the users and deliver a personalized experience. It is very easy to create a chatbot service poorly. Without proper research, UX design, testing, and execution, you can basically just spoil the chatbot. This may not cause any specific damage to business, but it has a negative impact on the company’s judgment. Your chatbot needs a persona. Use customer personas to understand the behavior of particular user groups better – for example, what they expect from the website and the company. Create a personality which not only resonates well with groups but is also engaging and fun. Use waiting time. Waiting adds an additional “human factor” to the conversation. When people talk to each other, the response time can be very random; people don’t always respond exactly upon receiving a message. Waiting time can also ensure that the user has time to process the information that the chatbot provided. Perform A/B tests. If you aren’t sure about how the users will react to certain elements of the bot, create multiple versions and measure the results. Identify the most difficult aspects of the UI and see what works best. Avoid a wall of texts. As with a blog post, seeing a huge block of text can be overwhelming. Test your messaging app on as many devices as possible, check the messages on different screen sizes, and use emojis every once in a while to break up the text. Since chatbots are designed to understand user information and preferences, to answer a question such as “What will the weather be on Saturday afternoon?” the bot would require a connected database and the geodata of the person who asked. More complicated chatbots are not only able to access multiple databases, but are also connected to multiple applications. A good example is Assist’s chatbot, which allows us to order a taxi or book a table at a restaurant. All it needs is a few requests from us through Facebook Messenger. Now, here’s how you build your own chatbot. The first and most important step when building a chatbot is choosing the right software. Nowadays, we have more and more options to choose from, but the two most popular chatbot-making software are undoubtedly Chatfuel and ManyChat. Thanks to the drag-and-drop function, both can be considered beginner/user-friendly so you don’t need any programming experience to use them. Both tools are free (ManyChat has a Pro version). In my opinion, Chatfuel can handle more complicated tasks, so if you need a bot for more complex reasons, I’d recommend that you choose this platform. From a marketing standpoint, however, ManyChat has one huge benefit compared to Chatfuel: a powerful list-building feature. Understanding the concept of the user experience is vital, so make sure you greet new users with a proper greeting text and welcome message. It might sound weird but there is a difference between the two texts (greeting vs. welcome). The greeting text is something that comes up immediately when the chat panel is shown, before the interaction starts and has to contain a really short and informative message. After the user decides to start a conversation she’ll see a welcome message. Here you need to be more precise and detailed. You can offer a specific product or service to get the user into the flow or you can describe what action you expect from from the user (subscribe, view, download, etc.) and create the corresponding buttons. 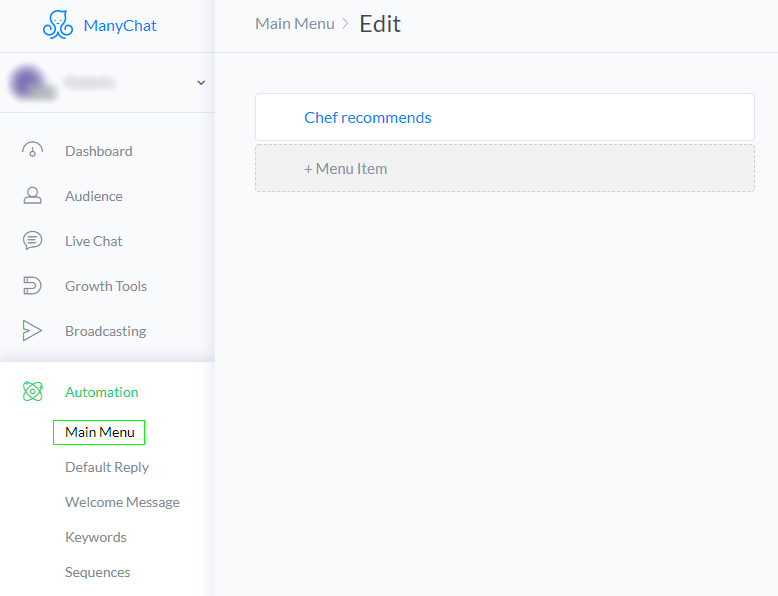 The main menu will be one of the most important elements of your chatbot as this will help guide your visitor and navigate the conversation in the right direction. You can set up the main menu on the Main Menu tab under the Automation menu and all you need to know is that it only consists of keys. Each button will launch an action, process, or conversation. 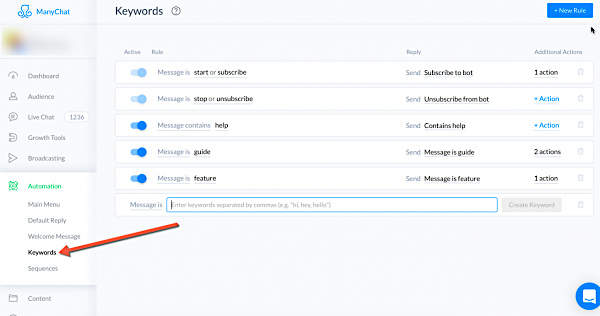 The keywords menu is exactly what the name suggests – you can enter different keywords to which the chatbot can react with a preconceived expression. For example, you can set the word “delivery” when sending a message to the bot to respond to shipping information. You can do the same with important terms such as “e-book”, “download” or “tutorial”. In ManyChat, the default is “start, subscribe” and “stop, unsubscribe”. By entering these, the chatbot offers the user the ability to subscribe and unsubscribe from the messages. Designing and optimizing sequences is an important task, as this is one of the main tools for list construction. These sequences are similar to autoresponders that are well-known from email newsletters. You can create as many different sequences as you like and put them into certain conditions (for example, “press a button”). This step is optional but I still recommend that you not leave it blank. Sometimes the bot will get confused, as people often like to test the intelligence of chatbots. If you wish to avoid the awkward silence, the best option is to be prepared with a couple of default replies, those messages that the bot will use for any terms that it did not recognize. The difficulty of chatbot creation is not the implementation but the design itself. First, you need to figure out what the purpose of a single function will be and then you need to plan the conversation in detail. You have to control the conversation, but you also have to keep an eye on what happens when someone leaves it. With a little patience and some very basic tools, you can set up your own chatbot by following the above-mentioned tips.